Buried Treasure Ice Cream Plastic Character Sticks came in a variety of colors and shades. Historical Buried Treasure Ice Cream Sticks Information with lots of Memorabilia Pictures. A website, where Fans and Collectors can take a sentimental journey back in time, share cherished memories, and pictures. We enjoy communicating with other collectors and are interested in buying - trading - selling. Enjoy as you take a sentimental journey back into the past. 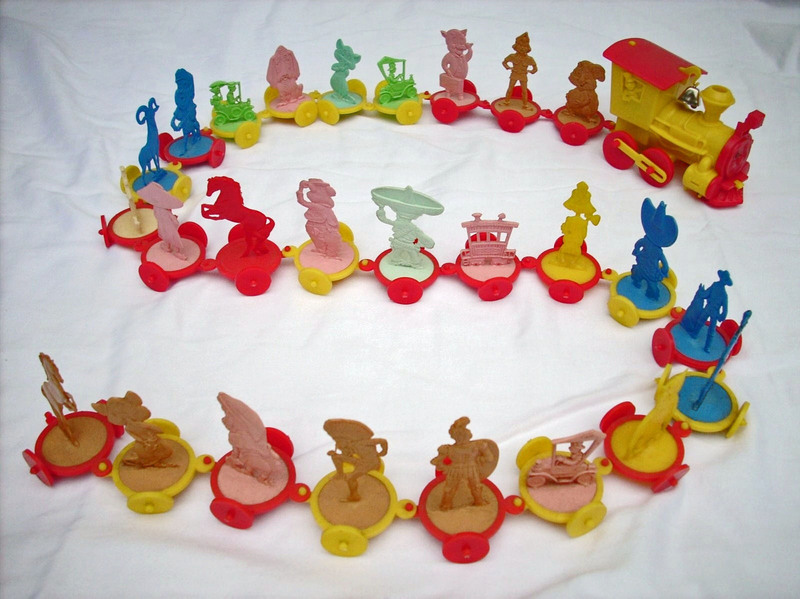 The following six pictures display all 65 Buried Treasure Ice Cream Character Sticks, each in a variety of colors. Buried Treasure Sign - 13" x 20"
The Buried Treasure Ice Cream Sticks (BTICS) were first manufactured and sold in the 1960's. There were several companies that put their own brand of ice cream on the BTICS. They were sold by various ice cream trucks, parlors, stores, etc. Hidden underneath the ice cream of each Buried Treasure Ice Cream Stick was a "buried treasure" character figure. One never knew what "character" they had until the ice cream was eaten. There were a total of 65 different characters manufactured that made up the complete set of BTICS. Of those 65 characters, 80% of each character were manufactured in the basic common colors - Red, Blue, Green, Yellow, and Off-White. The remaining 20% of each characters were manufactured in an array of colors varying in shades and hues. This made it more fun trading to collect all 65 different characters in an array of exciting colors. After all these years, it is still as exciting and challenging today as it was then, to collect all the 65 characters, not only in the basic common colors, but to collect each character in all the many varying shades and hues of colors they were manufactured in. Buried Treasure Store Sign - 8" x 10 3/4"
This sign is printed on clear plastic (picture was taken in front of a White cardboard). The side strips peal off to adhere to a store window. Then adhered to a window, only the chest shows. 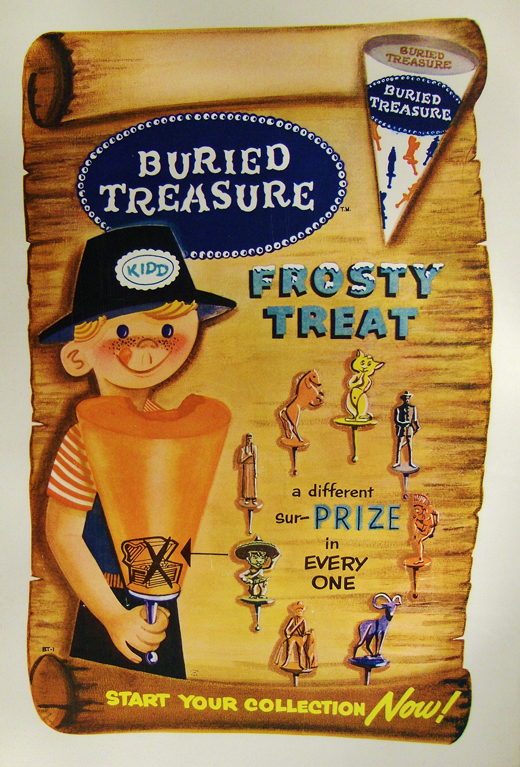 The Buried Treasure Ice Cream Sticks were made of either hard dense plastic or flexible translucent plastic. Each character came in a wide range of colors: from dark, medium, light, to pastels in an endless array of shades. 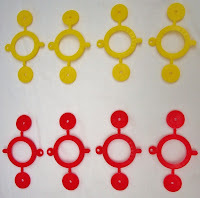 ﻿At the manufacturing plant, when changing the color of the characters on the assembly line from one color to another, occasionally, characters were stamped out before the two colors were mixed together in the molten plastic batch, creating multicolored "marbled" characters. Out of all the millions manufactured, you were lucky if you got a marbled character! Rare but occasionally, a character was manufactured defective/deformed from the original casting mold. Some closely resembled the original character, and yet were "uniquely different." There may have been more than one Buried Treasure Ice Cream Sticks manufacturing plant, as there were three different size typesettings and three different raised printings on the stems. (middle stem) were manufactured in Australia? The BTICS characters were manufactured on a single base stick. 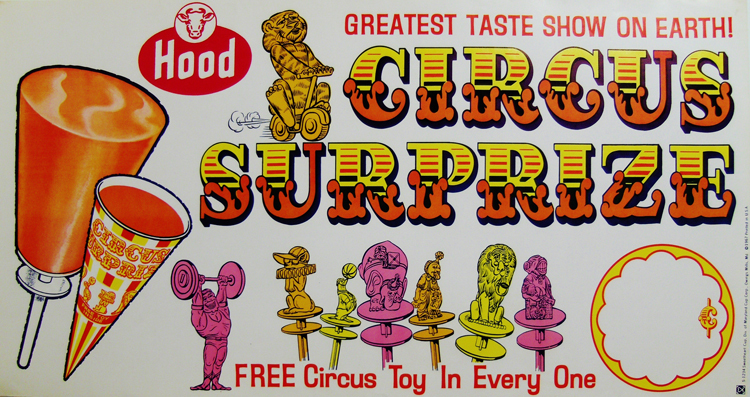 The Circus Surprize characters (which closely resembled the BTICS) were manufactured on double base stick by another company around 1967. The Circus Surprize characters are not as sharply detailed as the BTICS with off shade colors mostly resembling army colors, but they are still fun to collect. We are still investigating what company manufactured the Circus Suprize characters. 1967 Circus Suprize Sign - 9" x 16 3/4"
Note: There may have been other double base characters manufactured. Colorful Advertising Poster Signs were Printed Promoting the Sales of the BTICS and Associated Novelty Items. Various ice cream companies put their brand of ice cream on the Buried Treasure Ice Cream Sticks. One of these companies was H. P. Hood & Sons, a large dairy corporation whose headquarters was based in Boston (Charlestown), Massachusetts. Buried Treasure Sign - 11" x 11 1/2"
Bruce Parker and Eugene Collier were the inventors of the Buried Treasure Ice Cream Sticks. Big Drum Products, Inc. was the holding company (a major stock holder) in the Buried Treasure Corporation. The Buried Treasure Corporation introduced a Locomotive with eight train cars. It is a really nice collectible novelty item. 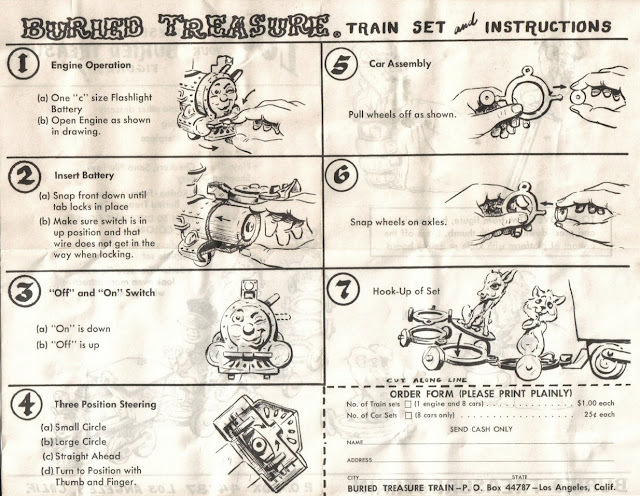 This Instruction pamphlet came with the Buried Treasure Train Set. The brochure reads; to remove stem, grasp stick and snap stem off? Bad instructions!!! Most likely, the majority of characters were damaged in this process. The brochure should have read something to the effect; carefully saw off or grind down stem. Smooth base with emery board. BTICS have been painted and altered for various reasons - Christmas tree ornaments, etc.. The Buried Treasure Train brochure reads: Buried Treasure figures look even more attractive when painted. The majority of collectors agree, a BTICS loses it's value once altered. 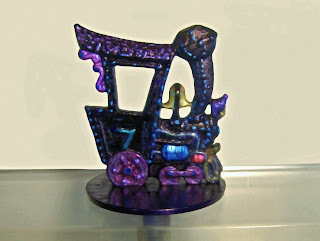 This painted (pyramid painted) locomotive was a gift to Trent, a lad who loves trains. Anyone desiring to use any information or images from this website, contact us at btics@q.com. 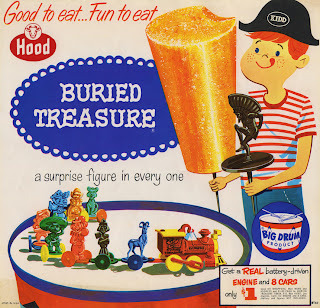 We have been collecting Buried Treasure Ice Cream Sticks and associated memorabilia items since the 1960's and created this blog of our personal collection for your enjoyment. We don't know how many different characters or associated items may have been manufactured, other than what we have in our personal collection. We are always in search of any Buried Treasure Ice Cream Sticks and associated memorabilia items that we do not have, and are also interested in duplicates of some of our characters and associated items. 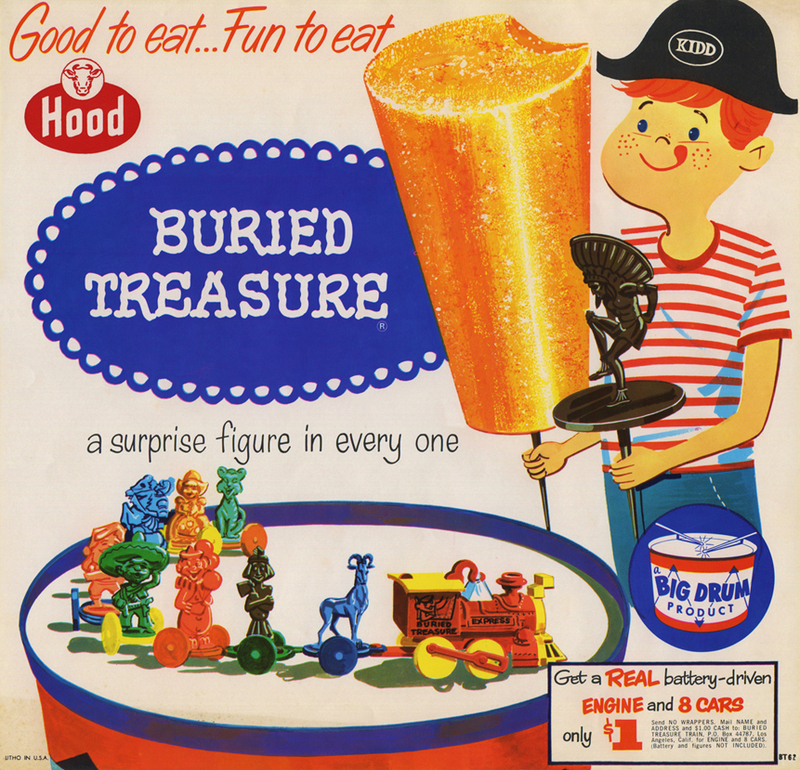 We would love to hear from anyone having any Buried Treasure Ice Cream Sticks or associated items for sale or trade. This brief history of the Buried Treasure Ice Cream Sticks was written and compiled from various Internet websites and knowledgeable sources that were associated with the Buried Treasure Ice Cream Sticks origin. At the bottom of this Section II, we have listed several website links for in-depth information. At the 1904 World's Fair, an ice cream maker ran out of bowls. So he asked a nearby waffle vendor to roll waffles into cones, eliminating the need for a bowl and spoon, thus creating the first "ice cream cone." The Parker brothers, Bruce Parker and twin brothers, I. C. and J. T. "Stubby" Parker purchased sugar cones from the Cream Cone Company and filled them with ice cream for sale. One day, in 1928, I. C. Parker set an ice cream cone next to a bowl of nuts to answer the telephone. When he returned, he found the ice cream cone had fallen into the nuts. He thought, what a great idea, I. C. Parker and his brothers, took this a step further by dipping the ice cream cone in chocolate, then adding nuts. I. C. Parker's wife, Jewel, said it resembled a fried chicken leg, so they named it the "Drumstick" ice cream cone and founded the Drumstick Company. 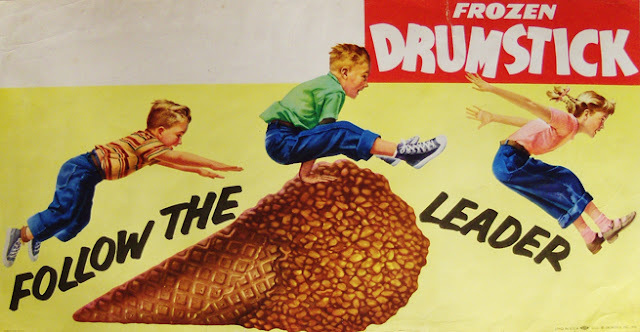 1956 Drumstick Sign - 9" x 16 3/4"
In 1949, the Parker family merged their Drumstick Company with the Cream Cone Company. Robert Wise, a nephew of the founder of the Cream Cone Company and aeronautical engineer, partnered with the Parker family in constructing a new Rotary Baking oven - an integral part of the company's success. 1958 Frozen Drumstick Sign - 8 1/4" x 21"
﻿﻿﻿A company called Big Drum Products, Inc. was the holding company which owned the majority of the Drumstick Company's stock and became their international sales agent. The Drumstick Company grew to a worldwide corporation and also pioneered in the development and promotion of ice cream novelty items. 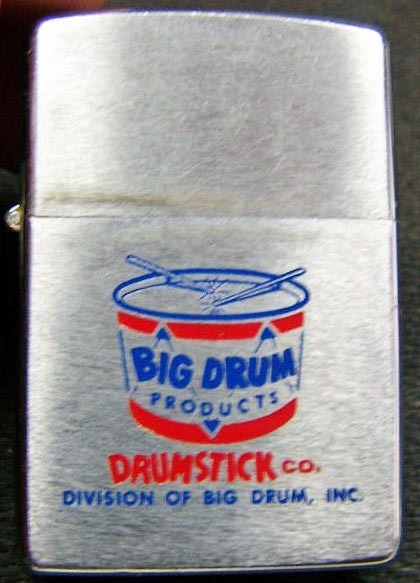 Here are two Promotional Items of Big Drum Products, Inc. While all three brothers, Bruce, I. C., J. T. Parker, and other family members continued maintaining and widening the success of the Drumstick Corporation, they also invested in and established other ice cream companies and related products including novelty items. 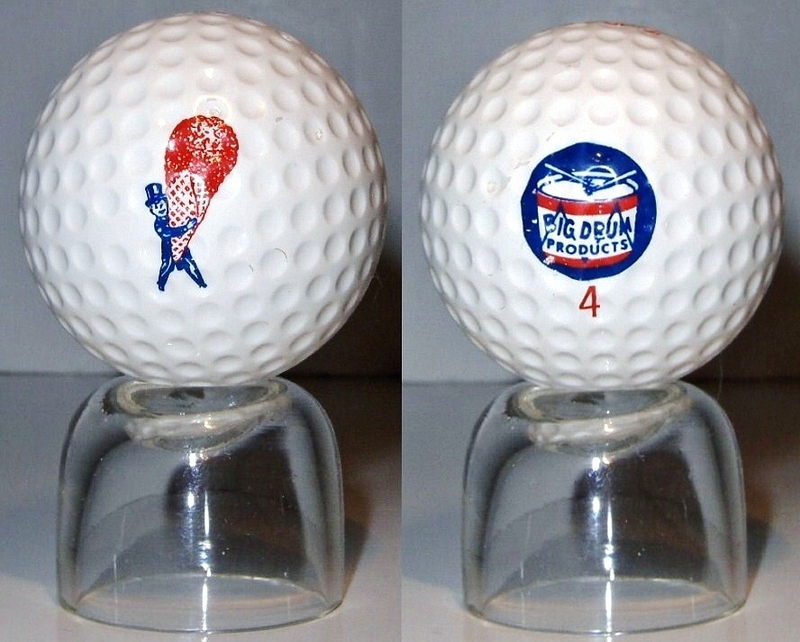 Drumstick wrapper 4 1/2" x 7"
J. T. Parker became the chairman of the board of directors for Big Drum. His son, Thomas L. Parker, became the president of Big Drum and the Krispy Kake Kone Kompany. We all cherish our fond memories of yesteryears. As we take a sentimental journey down memory lane, we occasionally wish the Buried Treasure ice cream cones were still available today. 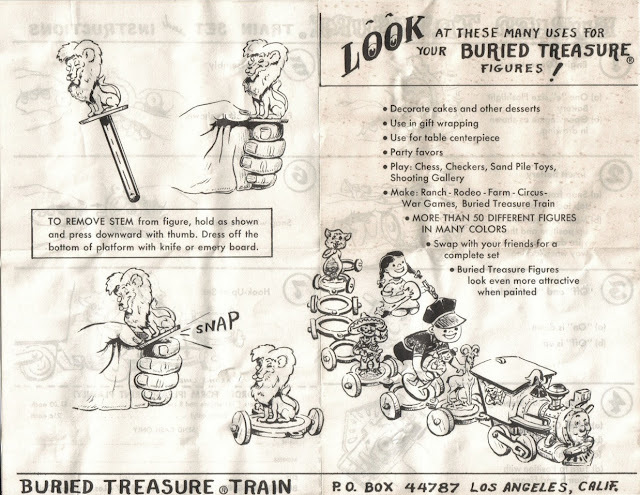 Of all the ice cream novelty items ever produced, the Buried Treasure ice cream character sticks were one of the most successful. They were enjoyed by both young and old alike. After all these years, the Buried Treasure Ice Cream Sticks are still fondly remembered. There are still thousands that exist today. 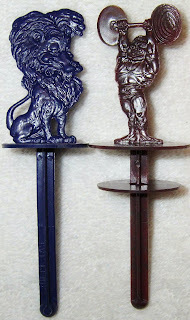 They are prized and protected by fans and collectors. Please notify us of any mistakes or misrepresentations, so the error(s) can be corrected. For further in-depth information, refer to the following Internet websites. Be sure to browse the history section in each website. Without knowing if the core molds still existed or not, we pursued the possibility they might still exist and how exciting it would be to locate the original BTICS core molds. After months of research, tracing the history of the Buried Treasure Ice Cream Sticks from their origin, The Buried Treasure Corporation and affiliated corporations, through years of mergers, acquisitions, and restructuring, we were surprised and happy to locate two BTICS core molds that had been stored nearly forty years in the back of a warehouse in Columbus, Ohio, owned by a supplier of machinery and/or packing for ice cream novelty products. After a year of negotiations, a price was agreed upon and we purchased them. Four months later, the core mold were delivered. We are currently in the process of restoring them to working order. They will be stored in a moisture and temperature controlled environment. After we are finished restoring the core molds, we will post updated pictures of the characters they contain and some information on the process used by core mold injection companies. Section IV, Buried Treasure Ice Cream Sticks - Questions and Answers, is for posting questions, and for anyone knowing the answer, to post a reply. Questions: Will be numbered # and the date posted in the order received. Answers: Be sure to include in your answer, the question reference number # and the date the question was posted. All submitted questions and answers will be reviewed for content and appropriate language before posting. If necessary, we will contact the sender for clarification. If a question and its answer are essential to the history of the Buried Treasure Ice Cream Sticks origin, they will be entered into either Section I or Section II of this blog. As new questions are received, it may be necessary over a period of time to remove some previous questions that have already been answered. Section V was created for Fans and Collectors to share their special stories and/or post vintage pictures of Buried Treasure Ice Cream Stick events and activities. All submitted stories will be reviewed for content and appropriate language before posting. If necessary, we will contact the sender for clarification. Other interesting websites worth visiting with fond childhood memories. This comic strip, Werebears and Only Children, was created by Jennifer Barrett of Newfoundland in the Winter of 2007 for The Scope, a bi-weekly entertainment newspaper in St. John's, and ran until the Spring of 2010. Jennifer Barrett, winner of VANL-CARFAC EVA Award for Emerging Visual Artist and NL Arts and Letters Awards. An interesting comic, Afternoon Delight, about Buried Treasure Ice Cream Sticks can be found in ARCHIVES - June 2011. Cheryl McNulty's Website on Artwork, Inspiration, and Daily Reflection. An interesting short story, Jolly Joe, The Ice Cream Man, about Buried Treasure Ice Cream Sticks can be found in the TOP POSTS section or in ARCHIVES - November 2010. Great job on bringing back memories of those old Buried Treasure Ice Cream Character Sticks. I especially appreciate the listing of all character sticks known to date, along with color variations and those which were manufactured defective/deformed from the original casting mold. "Thank you for providing information like this for people like me. This gave me a lot of unknown history of what the little sticks were and how they came to be..glad to learn about the "Drumstick" thank you again, tom in Tenn."
Brings back many childhood memories of chasing after the ice cream truck. So glad I found your website. It has been fascinating reading the history. Thanks for identifying the Buried Treasure Red Pawn chess character stamped MADE IN ENGLAND that I found here on a beach in Northern Ireland and for all the great detailed photos. On the lookout for more now. Best Wishes Tracey McKane. 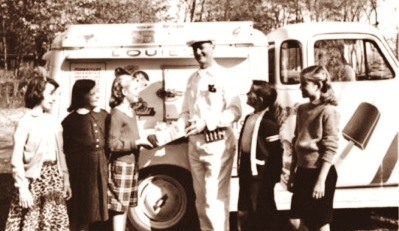 Collector of Buried Treasure Ice Cream Sticks and associated memorabilia since the 1960's.